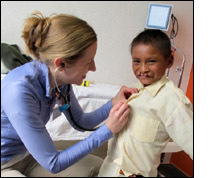 In December 2010, I joined a team of 53 medical volunteers on an inaugural Operation Smile medical mission to San Crist�bal de las Casas, in the state of Chiapas, Mexico. Dedicated to providing free reconstructive surgery to patients suffering from cleft lip and palate, our team consisted of plastic surgeons, anesthesiologists, pediatricians, pre/post-op and OR nurses, dentists, a speech therapist, child life therapist and two high school student volunteers. Our team was truly and international one, with volunteers hailing from Panama, Italy, Bolivia, Colombia, Ecuador, Canada, the United States, and Mexico. This mission trip was my eleventh with Operation Smile, but my first time serving in Chiapas. From the moment we arrived, it was evident that there was a great need for medical help in the region. Chiapas is the poorest state in all of Mexico, and is located in the deep south, along the border with Guatemala. It was the site of the Zapatista guerrilla uprising of 1994, where leftist rebels overthrew the government in San Crist�bal for a brief period. It is the home of Mexico�s indigenous Maya people, who still speak their ancient Tzotziles and Tzeltales languages. These people live in the Cintur�n de Miseria (the Belt of Misery), a series of squalid, violence-ridden, shanty colonies surrounding San Crist�bal, that lack clean water and basic amenities. Our first evening in San Crist�bal, we found a 16-year-old boy in the market with a primary unrepaired cleft palate. I later learned that our translator�s cousin died in infancy with a cleft lip, due to extreme malnutrition. We were all impressed by the magnitude of need here. During the first two days of our mission, we screened 160 patients. Surgeries are selected on a number of factors. One is the primary mission of Operation Smile, which is to provide free reconstructive surgery to children suffering from cleft lip and cleft palate, and to train local doctors in these procedures. One of the hardest, but most important parts of screening is to decide which kids cannot receive surgery on the basis of safety. Post-operative care after these surgeries is pretty basic, but the kids aren�t. Many have co-morbid conditions (upper respiratory infections, congenital heart defects) and syndromes (Pierre-Robin, Treacher-Collins, etc.) that make anesthesia and post anesthesia recovery hazardous. Coupled with the fact that we would be caring for 20 � 25 surgical kids each day, we knew we needed to keep safety as our primary goal. As a result, we had to turn away 60 children and adults that we could not operate on during this mission. During our surgical week, our team safely performed 102 surgical procedures on 99 children. The days were long, beginning with a 5:45am wake-up call, and a pre-dawn bus ride to the hospital. We left the hospital in the evening, and usually got back to the hotel by 8 p.m. After a quick trip to a local restaurant for dinner, we were in bed by midnight  only to start it all over again the next day. We all came away with many stories from Chiapas, but one patient in particular that captured everyone's heart was lovingly nicknamed our cantante. Jorge was a ten-year-old boy who arrived to screening with a primary unrepaired cleft lip. Miraculously, he had never let his deformity stop him from expressing himself. On the day of Jorge�s surgery, our Child Life Specialist discovered Jorge�s talent for singing. He was soon serenading all the other patients and families waiting for surgery. When it was Jorge�s time to go back into the operating room, he insisted on dedicating a song to all the nurses and doctors before his surgery. He entertained everyone in the OR with a lively rendition of a Mexican folk song. Then one of our Pediatric Anesthesiologists, holding an anesthesia mask, asked Jorge if he wanted a "microphone" to sing into. Jorge eagerly placed the anesthesia mask over his mouth and sang himself to sleep. When Jorge woke up again, his lip was repaired and a new life awaited him. I�d like to think that we have begun to build a foundation of trust with the local population and our counterparts during this first mission in the state of Chiapas. Operation Smile is planning a follow-up mission to Chiapas this Spring, and I would like nothing more than to be a part of that mission as well.